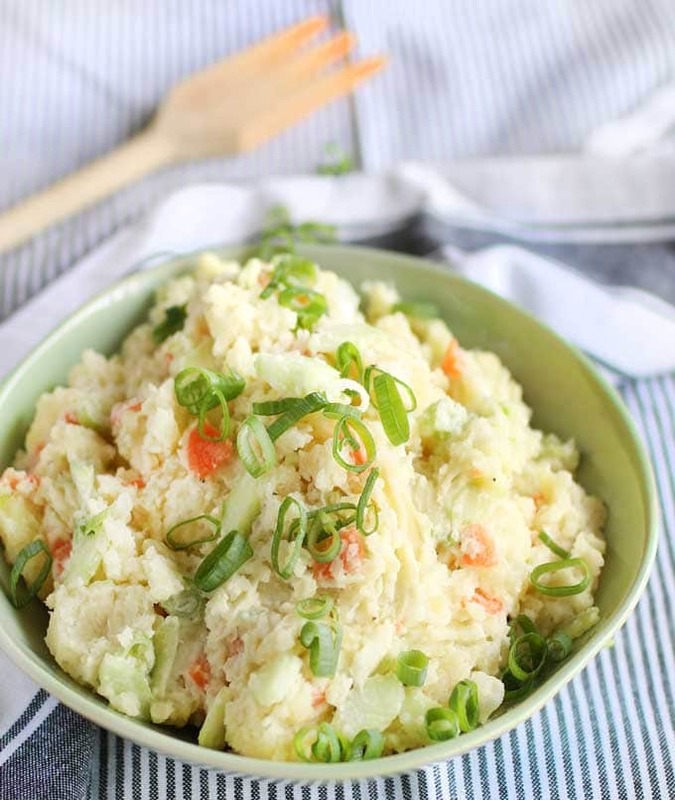 Japanese Potato Salad is a Japanized version of classic American potato salad: mashed potatoes, carrots, cucumbers and scallions with spicy mustard-mayo-vinegar dressing. This is a great summer side dish that goes beautifully with anything grilled. Japanese potato salad falls into the category of yōshoku: Japanized “Western” food. Just as we Americans “Americanize” Japanese food by adding such things as cream cheese and avocado to sushi, for example, Japanese chefs have taken certain European and American dishes and tweaked them to suit their own palates. I learned about Japanese potato salad while developing a recipe for Japanese Yakitori Chicken. In Japan you’ll often find the two side by side. They’re meant for each other. Just add some ice cold Japanese beer for a meal of pure perfection. 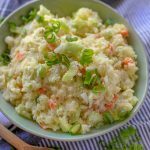 Japanese potato salad is perfect summer fare, great for a picnic, outdoor entertaining, or on the side with anything grilled. The first step is to cook the potatoes. I’ve tried this recipe with russets and yellow flesh potatoes. Both are great so use whichever look best. Peel the potatoes and set them in a pot of cold salted water. Bring them to a boil and cook them for about 15 minutes, until tender. Then, using a fork, partially mash the potatoes, leaving some small chunks for texture. While the potatoes are boiling you can prepare everything else. 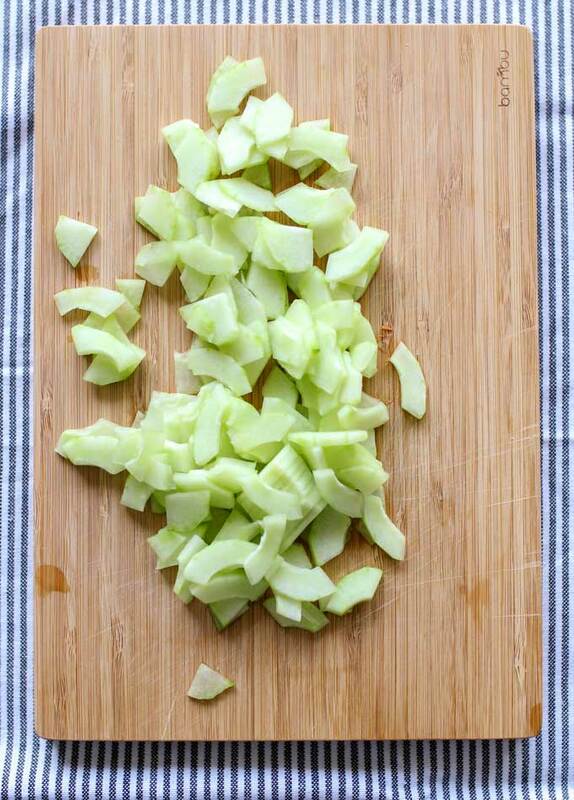 Peel and halve the cucumbers, scrape out the seeds and thinly slice them crosswise. Note, the cucumber’s core of seeds has lots of moisture so it’s important to remove it, to prevent your salad from being soggy. Next prepare the carrots. 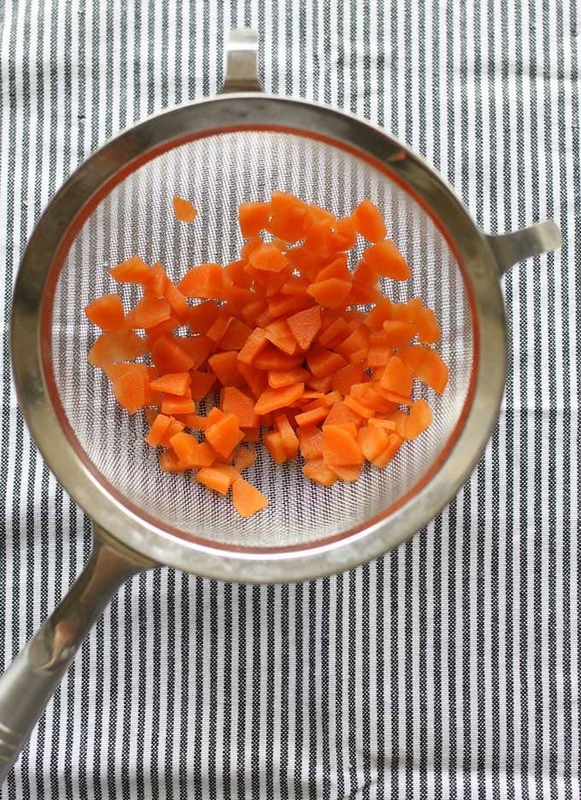 Peel and slice your carrot in half or fourths lengthwise, depending on how fat it is. Then cut it into thin slices, crosswise. Blanch the carrots for two minutes in boiling water. This will soften them a bit, enhance their color, and bring out their sweetness. 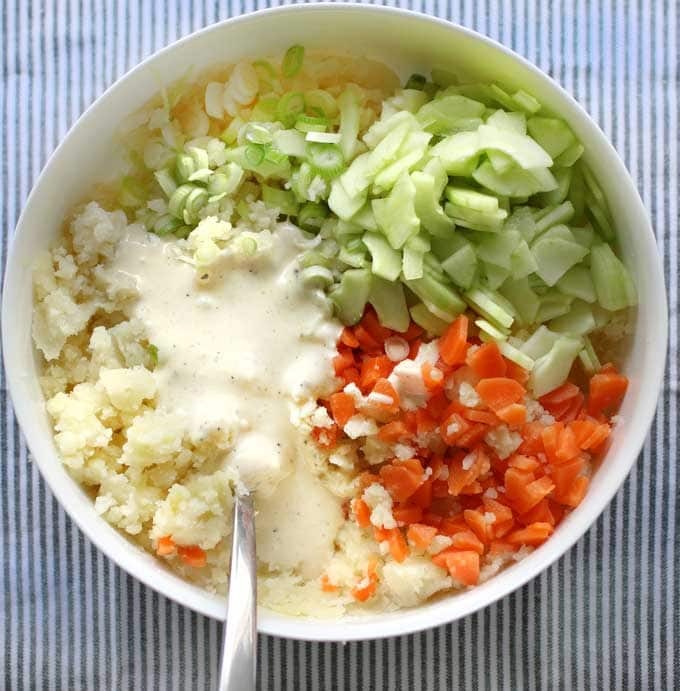 Whisk up the dressing ingredients: mayo, rice vinegar, mustard, sugar, salt and pepper. Toss everything together and chill until you’re ready to serve. You can make Japanese potato salad up to a day ahead and keep it covered in the fridge. Serve cold or at room temperature. One note about the mayo I chose for this recipe. 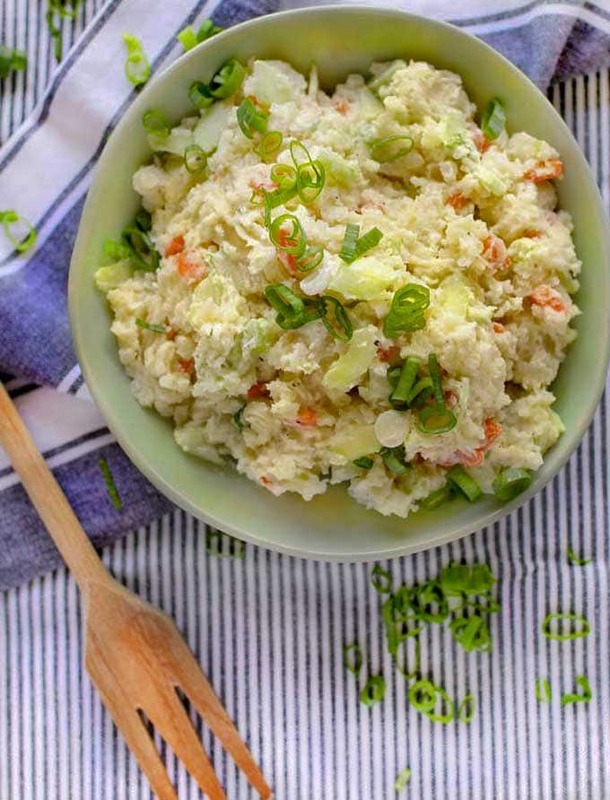 Japanese Potato Salad is traditionally made with Japanese Kewpie Mayonnaise which is sweeter and tangier than American Mayo. You can find it at Asian grocers or on Amazon. The problem for me is that MSG is a key ingredient in Kewpie Mayo. I’m sure the MSG adds a delicious punch of umami flavor to the mix but many people (myself included) have a bad reaction to MSG. I opted for good old Hellmann’s Mayonnaise and I am thrilled with the outcome. If you go with Hellmann’s and you want a bit more sweetness or tang, just add an additional teaspoon or two of rice vinegar and sugar to the dressing. I want to give a shout out to the blog Lovely Lanvin. 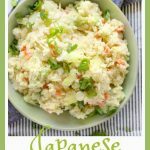 For year’s I’ve made their recipe for Japanese potato salad until I finally got around to developing my own version. For my fellow potato salad enthusiasts, here are two other delicious potato salad recipes that will win your heart: French Potato Salad and Estonian Potato and Beet Salad. Here’s the recipe for Japanese Potato Salad. If you try this recipe I hope you’ll come back to leave a rating and a comment. I’d love to know what you think. 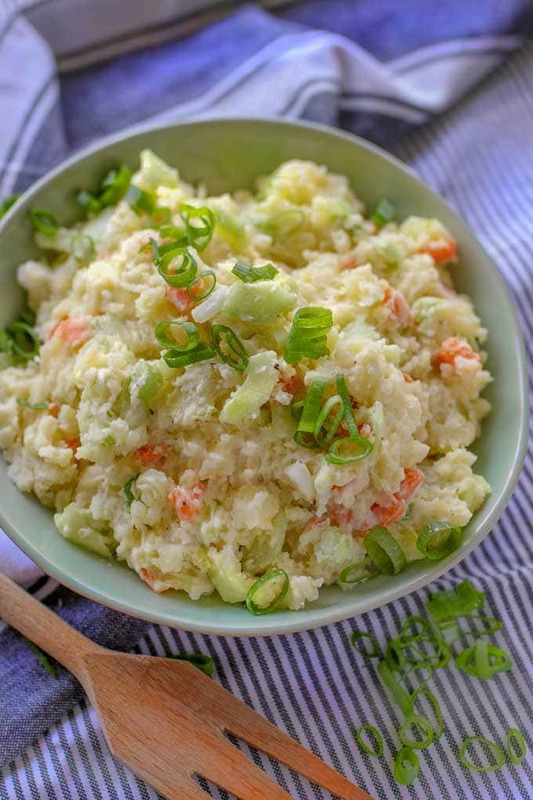 Japanese potato salad: a creamy potato salad of partially mashed potatoes dotted with crunchy carrots, cucumbers and scallions, and tossed with a zesty mustard-vinegar-mayo dressing. A great side dish for picnics, summer grilling and the outdoor entertaining season. 2 pounds Russet or Yukon Gold Potatoes, peeled and cut into 4 or 5 equal sized chunks. 1/2 of a small English cucumber, sliced in half lengthwise, seeds scraped out with a small spoon, each half sliced lengthwise and then thinly sliced crosswise. 1 medium carrot, peeled, sliced into halves or quarters lengthwise (depending on the thickness) and then thinly sliced crosswise. Put the potatoes and one teaspoon of salt in a saucepan and cover with cold water by by an inch. Bring to a boil and cook potatoes for 15 minutes or until tender when poked with a knife or fork. Drain in a colander and cool for 15 minutes or so. Blanch sliced carrots in salted boiling water for 2 minutes to soften them a bit. Drain in a colander and run under cold water over them to stop the cooking process. Drain for a few minutes to let them dry. Whisk all the dressing ingredients: Mayo, vinegar, mustards, salt, sugar, pepper. Set aside. In a bowl gently mash the potatoes with a fork, leaving some small chunks for texture. Add carrots, cucumbers, scallions and dressing to the bowl. Toss gently to combine. Season with more salt and pepper to taste. Chill until ready to serve. The salad can be made up to a day ahead and stored in the fridge. Scraping the seeds out of the cucumbers is an important step because the seeds are very watery and will make your salad soggy. Authentic Japanese potato salad calls for Japanese Kewpie mayonnaise but because MSG is a key ingredient in Kewpie Mayo and many people are sensitive to MSG, I’ve chosen to use Hellmann’s Mayo instead. I’m extremely happy with the flavors using Hellmann’s but feel free to substitute Japanese Kewpie Mayonnaise if you like. This is the best potato salad I’ve ever had. Better than warm German, even. I thought there was no mayonnaise at all, maybe the rice vinegar calms it down? Anyway, taste, texture, everything about this is fantastic! We’ll make it! I’m thrilled to hear that you enjoyed the potato salad so much Matt. It’s my favorite too! Thank you for taking the time to leave a comment. WOW this salad looks and sounds so delicious! Thanks! I love it. Let me know what you think if you try it.